I felt pretty good when I left the house this morning. One of those "look at me, I'm so on top of it" mornings. I had looked ahead at the lunch menu and saw that school lunch was spicy beef and rice, a definite no-go for the boys. So I packed their lunches and while I was at it, I packed Annie's too. Then I even packed a lunch for me. I'd made sure the boys "Teamwork Tuesday" t-shirts were clean and ready to wear today. I told Robbie he'd be going to after care while Charlie went to the first day of his study skills class. I made sure Charlie remembered about the class. Before I left for work, I put dinner in the crockpot. Another small victory in the morning-time battle. Then I left home and realized about 2 miles down the road that I'd left my cell phone at home. Hello, handbasket. It was around noon when I realized that Teamwork Tuesday is next week. Oops. Pretty sure I'll be hearing about that one. Then I looked at the lunch menu to see what tomorrow's lunch is, you know, so I can plan ahead. It turns out spicy beef and rice IS tomorrow's lunch. Today's was cereal and fruit. Something both boys would have definitely eaten. So now I have to make lunch AGAIN. When I got to school at 3:30pm to pick up Charlie from study skills class, the teacher told me he was so eager and ready when he reported to her room after school...but that study skills class doesn't start until Thursday. At least the dinner that was in the crockpot turned out to be delicious. I know this because I've already tasted it. Apparently 6oz. of fat-free yogurt, some pumpkin flax granola and carrots is not enough to call "lunch" because when I got home I was ravenous, so I dug into tonight's dinner. Just a small taste test, you know. Fifteen minutes or so later, I heard my cell phone ringing. I found it (under a pillow on the couch) and saw that I had 5 text messages and 3 missed phone calls. Including one from the high school carpool saying that her daughter didn't go to school today and could I pick Annie up? Have I mentioned the school is 30 minutes away from home? In the direction I just came from 90 minutes ago? Happily, because I didn't return the carpool mom's message, she went ahead and picked Annie up. Well, that was a saving grace! Nothing that happened (or didn't happen) today was tragic. Nothing was even urgent -- well, except making sure Annie wasn't stuck at school. 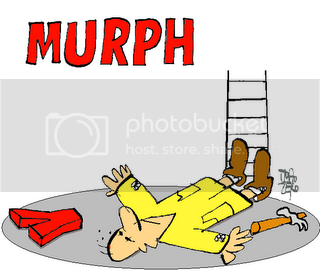 But nonethless, I'm ready for Murphy to move along and take his law with him. I HATE those kind of days...but at least you've gotten it out of the way for awhile! This was a delayed delivery from last month's Friday the 13th. You want to know WHAT? !